What can you say about fishing in the Gulf of Mexico! 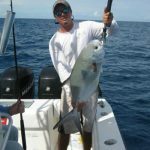 It is an absolutely spectacular place to fish, and is very unique to the Florida Keys, especially the middle and upper keys because of the lack of fishing pressure. It is truly a site to see Groupers up to 500lbs and Cobias swimming all around the boat! Kingfish as big as they come and Permit mixed right in there with them. Using all of the techniques that make offshore fishing so exciting! 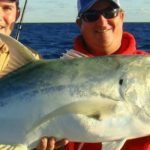 We catch huge Kingfish, Cobias, and Sharks off the kite, and the rest casting and drifting baits back on Anchor. We chum pretty heavy while fishing here too, as we are chunking and using block chum to draw the fish near. You can see the huge red blobs on the depth sounder as the monster Goliath Groupers start to gather under the boat! It is one of the most action packed and exciting trips that we do! 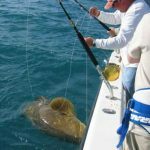 In a day you can expect to catch Goliath Groupers, King Fish, Cobias, Sharks, Snappers, Groupers, and Permit. Some of these come in and out with the season, but from December through May you can count on the majority of these fish! 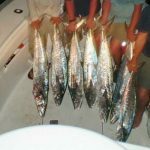 These trips are longer runs, this is why there is a difference in price and length of the charter, but well worth it! You have never been worn out fishing like this trip will make you! You can count on it!